Shown here is an Apple iPod poster announcing the debut of new iPods at Apple’s Live On Stage event back in '03. Below the poster are 2 Live t-shirts. On them is a working 3rd gen 4 button touch wheel 15GB iPod Classic that is currently formatted for Windows and is in good condition. It comes with a new genuine Apple wall charger and new usb and firewire charging and sync cables. The 3rd generation iPod Classic had launched a week earlier on April 28, 2003. 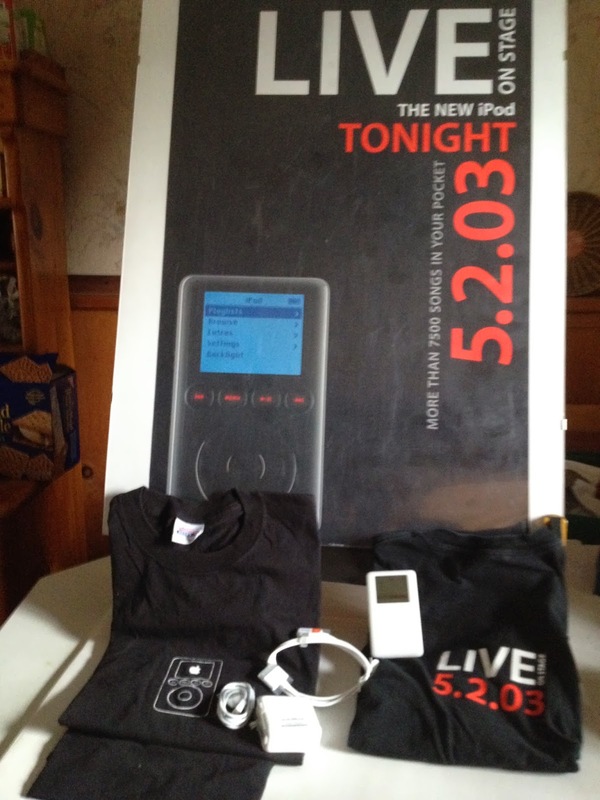 The LIVE event took place at the Fashion Island Apple Store in Newport Beach, CA with DJ Hawkeye "spinning" 2 iPods. This poster is printed on heavy stock paper and measures 37" x 20". It has some corner and edge losses, some light scratches on the lower black and some tack holes, yet is in quite good overall condition and will frame up nicely. It is priced at $80.